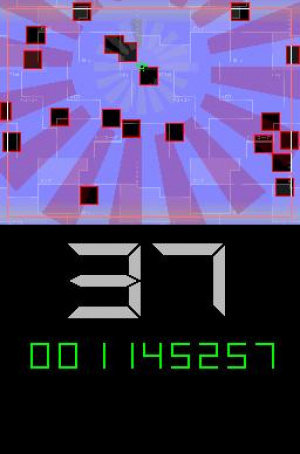 Tiny time-waster games like 99seconds really aren't all that dissimilar from the arcade games of old that we now look on so fondly as champions of game design: simplistic ideas with an execution engaging enough to keep the flow of quarters flowing. Here, the concept is a form of extreme keep-away with a slow-down mechanic, and while we probably won't look back on it with reverence in 30 years it's a simple pleasure that can be worth throwing some change at in the now. With 99 seconds on the clock, the goal is to survive to the end and rack up as high a score as possible by manoeuvring a little blocky dude around all sorts of shapes and obstacles that fly fast onto and off the screen. 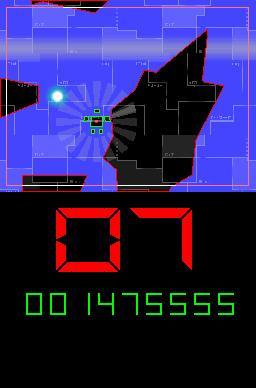 Grabbing a glowing capsule that pops up every so often adds an additional 9 seconds to the clock, and nabbing a blocky dude-shaped score bonus adds 99K to your tally. Getting hit results in a time penalty of sorts as you're unable to move around in that time, wasting precious opportunity and score. To make the fast-moving obstacles easier to deal with, holding any button slows down the environment's speed — as well as your score — but keeps character speed the same, in a sort of Bullet Time way. As the world comes to a crawl and eventual stop, it begins to creep backward and reduce your score, too. Once the clock runs down, the screen turns a menacing red and slowdown is no longer an option and smacking into an obstacle ends the game — but get another time capsule and the game continues as it was. 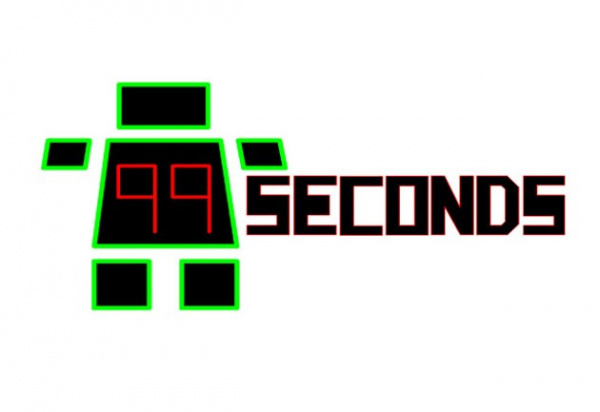 99seconds isn't a visual stunner nor an aural wonder (although each have their charms), but the gameplay is really what counts — and here it largely succeeds as a fun diversion. There is a bit of risk vs. reward strategy to consider as you weigh whether you can make it to that deviously placed time extension capsule, and score attackers could very well spend a good chunk of time wringing the slowdown mechanic for all its worth, but it'd be disingenuous to say that 99seconds is some deep masterpiece. While enjoyable in its own right, its pretty limited in scope and fairly disposable. Had 99seconds an arcade cabinet yelling for our attention, we would stroll right on up to it and put in the equivalent of 200 Nintendo Points for a quick challenge of skill. It's a title limited in scope but 99seconds does one thing and does it with competence, and that's probably all that we could reasonably ask of it before marching on to the next cabinet. I downloaded this and Bird Mania 3D on the same day. So far I can't stop playing Bird Mania. Somebody help me....seriously. Looks interesting, doubt I'll get it though. Haha, the sub-title is simply hilarious! If you're having girl problems I feel bad for you son. This game is worse then Bird Mania how? Playing both, this one is MUCH better in every way IMO. Why not "if your having squirrel problems I feel bad fer u son. I got 99 problems but a glitch ain't one."